Underfloor heating 25 Residential apartments, McEwan Square, Fountainbridge, Edinburgh. In February 2015 the contract for underfloor heating and screed works was awarded to Incognito Heat Co for 25 residential apartments in Edinburgh. Edinburgh based quality property developers, AMA Homes choose Incognito Heat Co as their trusted underfloor heating partners for the exciting development of 25 luxury apartments in McEwan Square, Fountainbridge, close to the vibrant heart of Edinburgh City. We were delighted to accept the challenge. 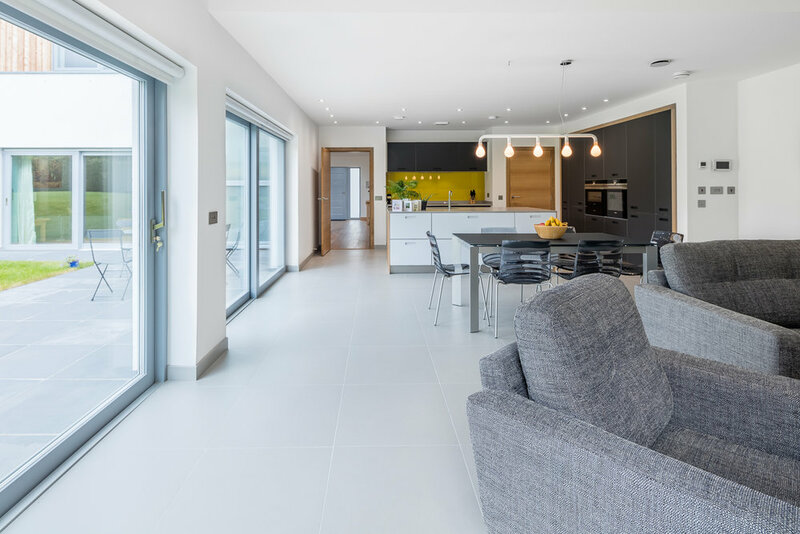 Tasked with designing, supplying and installing underfloor heating systems in each apartment, as well as supplying and fitting the flooring grade insulation and liquid flowing anhydrite floor screeds, throughout. As you can expect from Incognito Heat Co, we delivered this project, to our clients full satisfaction, on time and in budget, with absolute minimal disruptions to other trades we were working alongside. Our involvement began at the design stage, Initially working closely with the AMA Homes team of architects and consulting engineers. We established the needs, and set about designing systems that had to be a) user friendly, and b) would efficiently create luxury comfort conditions, in a quiet, calm and healthy environment. 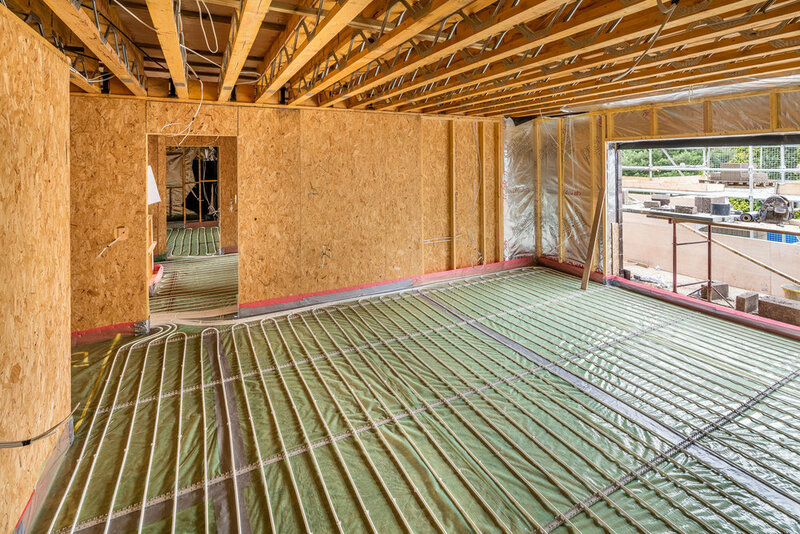 The AmbiTak UFH system was selected in conjunction with a laminated and gridded EPS insulation board which provides the base on which the underfloor heating (UFH) pipework was attached. The insulation was laid directly onto the concrete sub floor, pipework then laid in continuous loops, and clipped down in accordance with our designs. Once this process has been completed, and pipework pressure tested, we then pumped in a liquid flowing screed to a depth of 55mm throughout, providing 100% encapsulation of UFH pipework. As well as giving a perfectly flat level floor, this screed has excellent thermal conductivity, making it the perfect counterpart for an efficient underfloor heating system. Although this underfloor heating Edinburgh development was not without its fair share of challenging situations, which ranged from pumping screed material up six floors, to finding suitable parking without incurring the wrath of the local traffic wardens, we overcame, we resolved and delivered exactly what we promised. Project was completed, commissioned, and handed over in October 2015, the work was done, and our team our rightly proud of what they have achieved whilst working closely with AMA Homes Edinburgh. Our warm congratulations to the everyone who worked so hard to make this happen, they can deservedly relax in the knowledge that comfort conditions “beyond the ordinary” will be enjoyed for many years to come by the residents of McEwen Square in Edinburgh.